Entering the season Bills running back C.J. Spiller was nothing more than a backup. Two weeks into the 2012 NFL season, he’s the talk of the game at the running back spot. Spiller has been on fire the first two weeks of the year, and he and the Bills will look to duplicate last weeks effort vs the Chiefs as they travel to Cleveland Sunday to play the Browns. Spiller leads the NFL with 292 rushing yards and 364 yards from scrimmage after running for 123 and two scores last Sunday, and he will be enemy number one for a Browns defense that didn’t play too well in a week two loss to the Bengals. The Bills D played solid against the Chiefs in their win last week, forcing three turnovers against the Chiefs and holding them to 184 yards through three quarters. They will need to stop another up and coming back, as Browns RB Trent Richardson showed the star power the Browns have been looking for Sunday, beating on Bengals defenders in their setback. Richardson ran 19 times for 109 yards and a TD in the 34-27 loss. He also had a 23-yard TD reception to become the first Browns rookie to rush for 100 yards and score on a run and a pass in the same game. Brandon Weeden also shined in the loss, going over 300 yards. On the day he threw for 322 yards with a pair of scores. He’s got to be careful with the ball, as in his first home outing he threw four picks vs the Eagles. Bills QB Ryan Fitzpatrick has yet to be sacked, and he will look to pick on a Browns team that again will be without suspended CB Joe Haden. Last week Fitz had two touchdowns and 178 passing yards after getting picked off three times in the opener. Spiller will get his yards, but the Browns seem to have the look of a team ready to put it all together after their loss last week. The Browns will hand their home fans a rare win by the Lakefront. 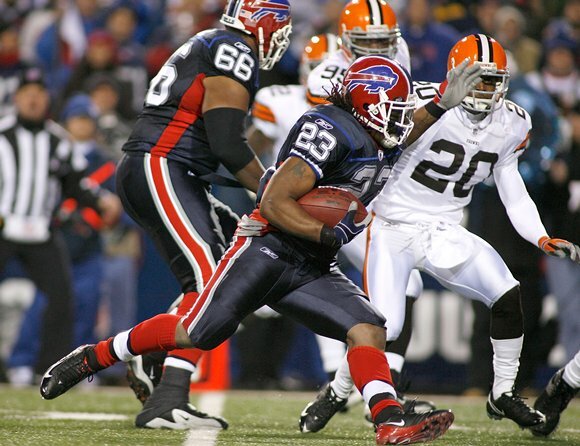 How Will Sunday’s Bills-Browns Game Turn Out?